For high school students, summer programs have strong appeal. Though many programs offer the opportunity for teens to get a head start and earn college credit while studying specific subjects of interest, the allure is usually far more than that. Summer programs come with the promise of experiencing the world in a way most teenagers never have before; they’re a rare chance for teens to be independent from their parents, to meet new friends from different places, to reinvent themselves, and most of all, to get a glimpse of the elusive college life that awaits them in the not so distant future. We spoke to three students from Tsinghua International School (THIS) about their experiences with summer programs in the US. The Discover Hopkins Program is a two-week intensive summer program that offers college level courses for credit and a chance for high school students to explore college level curriculum and courses. My first impressions of The John Hopkins University were that it is organized, eye-pleasing, and a paragon of a prestigious American university. From its nostalgic architecture to its beautiful scenery, John Hopkins looked postcard perfect to me. I enrolled in a course called Food, Nutrition, and Public Health; a class very much academically focused that offers lots of hands-on experiences. 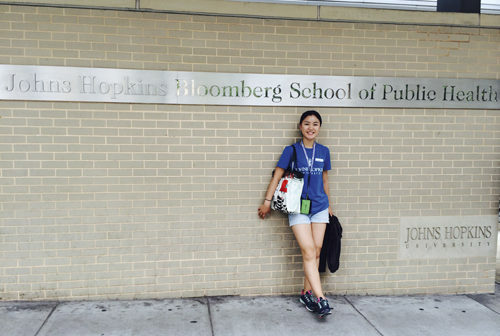 I had two instructors who were both PhD students at the Hopkins Bloomberg School of Public Health. The entire class was only 13 students, so it was very close and intimate. As the class covered food related and social issues prevalent in modern America, guest speakers from organizations such as Maryland Hunger Solutions were invited to give in depth lectures. Through the trip, I discovered what a prodigious role John Hopkins plays in the city of Baltimore. Everywhere we went, people talked about Hopkins and it was an honor to tell others that we were students there. Although Baltimore is known as “charm city,” like many other urban cities in America it also suffers from its deficits including poverty and drug abuse. The John Hopkins University and Research Center plays a major role in mitigating social, health, and welfare issues in Baltimore, which is how it has earned such a high reputation in Baltimore and all over the US. Many of my personal beliefs and interests correspond with John Hopkins’ core values and academics. Not only does John Hopkins have the biggest and most renowned public health studies in the world – which is what I intend on majoring in – they are very active in research and community work, which fulfills my long held desire to serve and improve my community. The best part of the trip was the chance to meet and interact with new friends, classmates, and teachers from all over the world. I had never met such a diverse group of people. The fact that everyone was so amiable and open was a highlight of my trip. The most interesting aspect, however, was getting to experience university life. Not only did we live on campus and attend college level courses, we also got to explore the city and get a sense of what it’s like being a college student. I stayed in the freshmen dorm Wolman Hall, which is right across the street from the university in the Homewood Campus area called Charles Village. In the Charles Village area, there are many coffee shops, supermarkets, and bookstores to provide daily necessities. If you ever get a chance to visit the area, try Insomnia Cookies, a little store right next to Barnes and Nobles. Trust me, you won’t regret it! I would definitely recommend this program to my fellow teens because it really gave me a broader sense of what university is like. It’s a good chance to explore a new part of the world, and practice independence, as well as prove to your parents and yourself that you are ready for college! I attended the Pacific Astronomy and Engineering Summit, an educational science conference sponsored by the Thirty Meter Telescope, a major astronomy project overseen by five countries: The US, Canada, India, Japan, and China, which aims to build the world’s largest observatory. The conference gathers high school students to represent their future youth innovators and scientists. I was one of China’s three representatives. Hilo is great. There are no mosquitoes, the temperature is mild, and the wind by the ocean feels amazing. We saw real blue skies, green grass, clear water, and even a sea turtle swimming by the shore! Hilo is a quiet town where the people are friendly, the architecture is beautiful. It even smells good. As if being in the hotspot of astronomy wasn’t enough, we stayed at the University of Hawaii, one of the best universities to study the subject. Three to five delegates per country attended, about 30 people in total. The content was highly academic. Professors from all over delivered lectures on current cutting-edge ideas in astronomy such as determining the composition of asteroids and methods for discovering exoplanets and their properties. Some technical parts I struggled through, but the professors simplified complicated concepts. We participated in various activities and workshops associated with building leadership skills, went on outings, and learned about the native Hawaiian culture. The most spectacular outing was stargazing on Mauna Kea, considered one of the most ideal places in the world for observatories due to its elevation and freedom from light pollution. I can’t express how amazed I was to look at the moon ultra close-up through my telescope. The local stargazing club brought their huge telescopes and walked us through constellations and other celestial bodies. We picked off Venus, Jupiter, Saturn, moving down the list to stars like Vega and Altair. We even saw Saturn’s rings! Unfortunately, it was overcast that day and protests made it impossible for us to get into the observatories or above the cloud line. While the Thirty Meter Telescope is a thrilling endeavor for astronomers and scientists, I learned it has caused dissent and unrest for others. For the native Hawaiians on the island, Mauna Kea is a sacred mountain that shouldn’t be disrupted and Thirty Meter Telescope is perceived as a foreign intrusion and an act of disrespect. Protests have halted the telescope construction for months. This is one example of scientific insensitivity that could have been solved diplomatically from the beginning. A lot of emphasis was put on our understanding that there are two sides to every story and how our actions impact others. I was really glad to see that understanding is being fostered because so many world problems could be solved this way. One challenge was the closing dinner when we were scheduled to give a presentation. I thought 30 of us would participate including teachers, advisers, and perhaps a few guest visitors. In fact, government representatives – including Hawaii’s senator – were in attendance, along with other members of academic panels and universities. Suddenly the high school level presentation I made didn’t seem to measure up at all. I think I did okay; people laughed at least. I realized that you don’t need to be an expert in order to get something out of an experience like this – you just need to push ahead and not worry about the social output. Not as a game changer, just as someone who wants to learn. In other words, there’s an opportunity for learning in every mishap. If you want to be in a science related field or an astronomer in the future, and if your school offers you the chance to participate, seize it. This is such a great way to meet new people and ask questions. My summer program was hosted by Summer Discovery, an organization that offers pre-college and college credit courses at several universities for high school students. The program I took is called The Business of Entertainment, Media, and Sports Institute and is sponsored and taught by the UCLA Anderson School of Management. The Business of Entertainment, Media, and Sports Institute introduces business strategies used by entertainment and sports companies. I had two course instructors; one covered the business side of film industries while the other focused on concepts such as communication modes between marketers and consumers and how businesses retain customers. Although classes were four hours per day, the content kept us awake. Film, music, and sports are topics teenagers are knowledgeable on and are naturally interested in learning more about. We received a case study each week published by the Harvard Business School and wrote an analytical paper in groups. One group assignment involved writing up predictions and recommendations for marketing upcoming movies like Superman v Batman and Sisters. Our class also toured the Los Angeles Dodgers Stadium and Paramount Studios. The UCLA campus is large and somewhat decentralized because the school buildings and main plaza – where the renowned Bruin Bear statue stands – are located south of the campus while the residential halls are situated in the north. We students lived in a residential plaza called Hedrick Summit. Located near Beverly Hills and Bel Air, the college town Westwood has everything a student would need such as restaurants, supermarkets, and mobile service stores. Los Angeles is a sunny, vibrant, and laid back city; Southern California in general has this vibe. Coming from Beijing, the days feel longer because people are enjoying themselves, rather than battling to fit in the subway car. It found it fascinating to meeting people at different social occasions and easily become friends. Everyone was extremely open and accepting – talking to strangers is completely normal. My suite mates would bring people to our common area, and I would naturally befriend them. Being at THIS for six years, I have welcomed new students to the school, but had forgotten how it feels to be somewhere completely new myself. One difficulty I encountered was deciding which group to hang out with at certain times. I woke up earlier than my suite-mates to eat breakfast with my classmates, yet I resonated more with friends from international schools in Asia. By frequently vacillating between groups, I realized that the closer they became, the more misplaced I was. However, acting more natural alleviated the awkwardness. I ended up spending more time with suite-mates in the dorms, talking more with classmates during class time, and having several dinners with other friends. It all boils down to seizing the opportunity at the right moment. The best part of the trip was the amount of freedom we had. Living on campus definitely resembles college life. You are out there alone and have to make decisions for yourself. After class ended at 3pm, we went on trips to Rodeo Drive, Santa Monica beach, Hollywood, and go-karting, to name a few. During my last week, I spent an afternoon shopping, returned for dinner, and jogged at the Drake Stadium at 10pm. I was more efficient and productive than ever and did not waste a minute. One thing I realized is that I ultimately prefer academics over activities. I joined the program for educational purposes and thus prioritized studying. My suite-mates would host impromptu dance parties outside the building and I would stay inside. Socializing is important, but there should be a limit. I would recommend Summer Discovery to high school students as the program maximizes students’ experience at UCLA. They arrange transportation to locations around Los Angeles as well, such as Disneyland and Universal Studios. Residential counselors are responsible for students, which is necessary for high school students. Forbidding us to go near the fraternity houses and having check-ins ensures student safety. If one wishes to attend a very academic program, however, I strongly recommend Summer Discovery’s six-week college credit program.